I don't appear to be alone in my confusion over the precise cause of Fernando Alonso's crash and what happened to him subsequently. First, McLaren assure us that rigorous tests - and, knowing McLaren, I have no doubt they were forensic - proved there was nothing wrong with the car. Then Alonso says of the steering: "Definitely…..it locked to the right". Even allowing for Alonso apparently running a different steering system, it's surely unusual to have steering 'lock' these days, never mind the team find no trace of it during their subsequent analysis? At least it's reassuring for all concerned to have Jenson Button say that having seen Alonso's steering trace, he still feels happy getting into the car. Regarding the impact, there's a contradiction in that Alonso suggests he might have been concussed at that point but he remembers everything in great detail when the car came to a halt. Then he says: "I lose the conscious in the ambulance I think, at the clinic at the circuit. Doctors said this is normal for the medication for helicopter transportation and checks in the hospital, the MRI and evaluation needs this protocol, needs this medication, so it's normal." Checking with friends in the medical profession, they are surprised about the final line because, according to one: "No medication is usually required for an MR. Sometimes when patients are found to be claustrophobic when in an MR scanner, they are given an anti-anxiety medication to relieve their fears of being closed in. This would not normally occur unless they had experienced this before or if it happened when they got into the scanner. And sometimes injections of contrast called Gadolinium are given, but they certainly don't cause any sedation.'" It is also unusual to be sedated in an ambulance under circumstances such as this and unusual that sedation should be administered in the helicopter. The general rule appears to be the need to keep the patient conscious - unless in pain, of course - in order to have both full understanding of their condition and their ability to assist with providing history of the incident on arrival at the hospital. 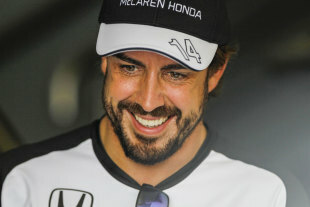 This is not to rebut in the slightest what Alonso says; he was there; we weren't. But you can see how this adds to the general air of confusion. In any case, all must be okay because the FIA medical team has passed Alonso fit, thus thankfully ruling out suggestions that he may have briefly suffered from some sort of medical condition leading to the accident. It's good to have him back. Now let's get on with the racing.